John Ralston Saul is the series editor for the exciting new series Extraordinary Canadians by Penguin Books. The biography series features 20 great Canadians, including Pierre Elliott Trudeau, Louis Riel, Lester B. Pearson, Rene Levesque, Wilfrid Laurier, Tommy Douglas and Emily Carr. 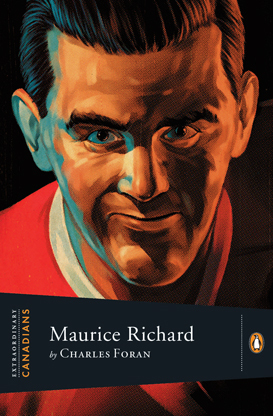 The series' mandate is to "rediscover twenty Canadians — rebels, reformers, thinkers, writers, painters, political leaders - who built modern Canada." Also included in the series, somewhat out of place at first glance, is Rocket Richard, the only hockey player. Although as we all know, Rocket Richard's legacy far transcended hockey. Charles Foran penned this 166 page book, arguing "that the province's passionate identification with Richard's success and struggles emboldened its people and change Canada irrevocably. This book is not so much about one of the great hockey players in the history of the great game. It is more about his influence - mostly symbolic and unintentional, accidental even - on Quebec's political and cultural transformation, as a nationalist icon and even a revolutionary catalyst. The book is expertly written by Foran, who recently won the prestigious Charles Taylor Prize for non-fiction for his biography of Mordecai Richler. He wonderfully - although at under 200 pages a bit too briefly - tells the story of Richard accurately with a novelist's brilliance. The influential life of Rocket Richard has been the subject of some truly wonderful books over the years. Charles Foran's entry is yet another epic text well worth your time. His passages on the 1955 riots and Richard's farewell to the Montreal Forum in 1996 are excellent reading.